In 1987, The Observer sent me to Ireland to interview Pierce Brosnan on and around the set of Taffin, which was then being filmed at Ardmore Studios. For some reason, the piece never ran; Taffin didn’t generate a lot of interest in the media, so it might have been that, or it might just have fallen between the cracks, as articles as sometimes wont to do. I had completely forgotten about it until going through a crate of papers the other day, and quite enjoyed reading it again after all this time, so I don’t think it was spiked as unpublishable. But who knows. Ironically, the film probably enjoys more name recognition now than it ever did around the time of its release, thanks to this line having been reborn as an internet meme, courtesy of Adam and Joe. This interview is pre-Bond Brosnan, and quite poignant, I think. 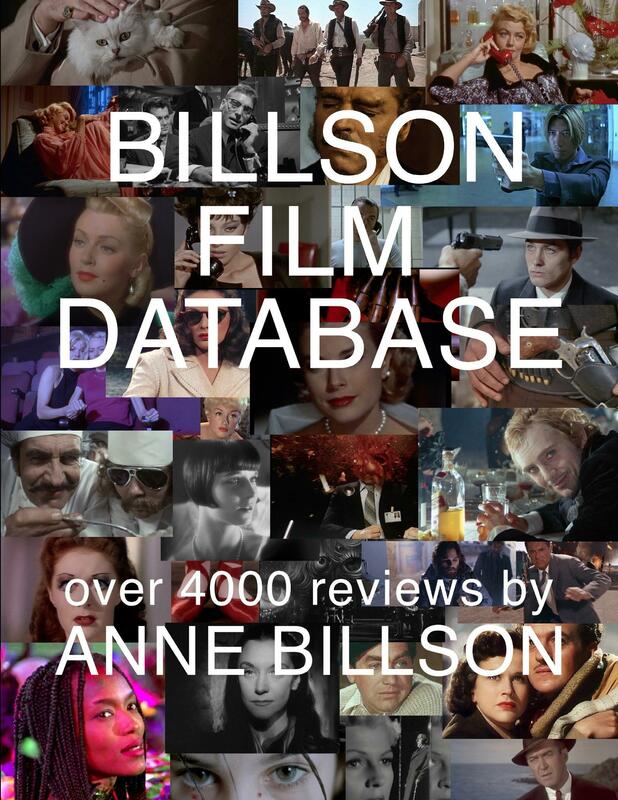 It must have seemed to him as though other guys were having all the luck – Timothy Dalton had been cast as Bond in his place, and Bruce Willis was reaping the rewards of Glenn Gordon Caron’s talent after the writer had parted company with Remington Steele and gone on to create Moonlighting. More tragically, Brosnan’s first wife (Cassandra Harris, who was present in the background during our interview) was to die of cancer a few years later. 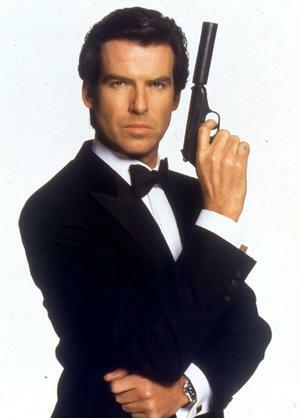 As everyone knows, Brosnan did indeed go on to play James Bond, in GoldenEye in 1995 – and play him very well, I thought. But his next three outings as 007 (Tomorrow Never Dies, The World Is Not Enough and Die Another Day) were greeted with increasingly hostile receptions, and for some reason, many people seemed to hold the actor personally responsible for the decline in the franchise’s quality. The role of Bond, like all such iconic roles, is a poisoned chalice. It makes you mega-famous, but you can never escape it, and audiences will never, ever let you forget it. Your subsequent films, no matter how varied, tend to be viewed as James Bond slumming it, and you are never quite taken seriously as an actor – at least not unless you manage to stick around until old age has taken the shine off your looks. I liked Brosnan as a person when I met him – he was charming, and disarmingly open while clearly trying manfully to be diplomatic – but I have also liked him as an actor in Nomads (John McTiernan’s first film), The Deceivers, Mars Attacks!, Dante’s Peak, The Thomas Crown Affair, Grey Owl, The Tailor of Panama, The Matador, Seraphim Falls and The Ghost. (I’ve left out some films I didn’t like, and cameos.) I didn’t like him in Mamma Mia!, but nor did I like anyone else in that, and heaven knows he was game enough. 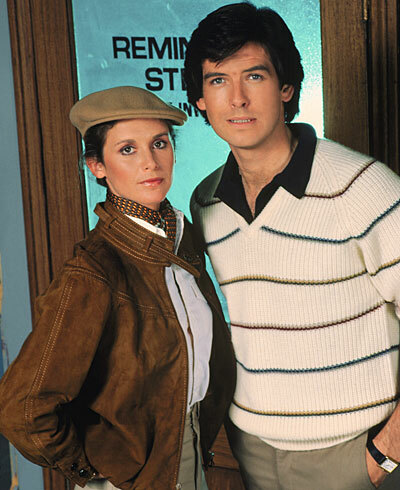 I have never watched a single episode of Remington Steele. 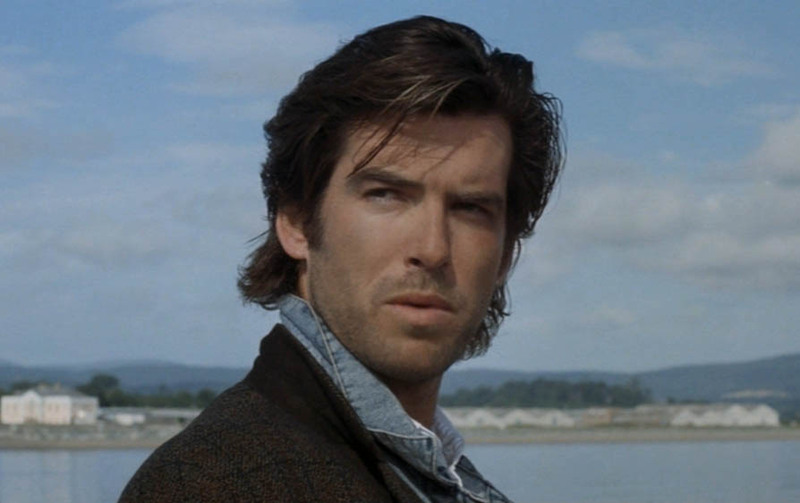 But I think Pierce Brosnan is a better and more versatile actor than he is usually given credit for. He takes creative risks, and seems prepared to send up or undermine his own image (The Matador and The Ghost are two such examples). I’d love to see one of the Young Turks of contemporary cinema (paging Tarantino – even though he’s no longer young) write for him the sort of preconception-busting role he could really sink his teeth into. The interview begins after this picture of Brosnan in Taffin. Thirty minutes later, outside Healey’s pub in Wicklow Town, a schoolgirl confides that she is hoping to get Mr Bronson’s autograph. There are, in fact, a lot of autograph hunters hanging around outside Healey’s, where a scene from the film Taffin is being shot. They’re all after a glimpse of the Big Star who has flown in from Los Angeles to play the lead role. Pierce Brosnan, aka Remington Steele, aka the man who was so nearly the next 007, is back on his native soil. Brosnan’s pet hate is people getting his name wrong. ‘Well,’ he says, ‘you have to live with that if you’re going to have a quirky name like mine.’ As far as forenames go, Pierce (‘as in the verb to pierce‘) is probably about as macho as you can get, but it’s not the product of some Hollywood PR’s imagination; the name has been in his family for three or four generations. As for Brosnan, that’s a common enough handle in County Kerry. 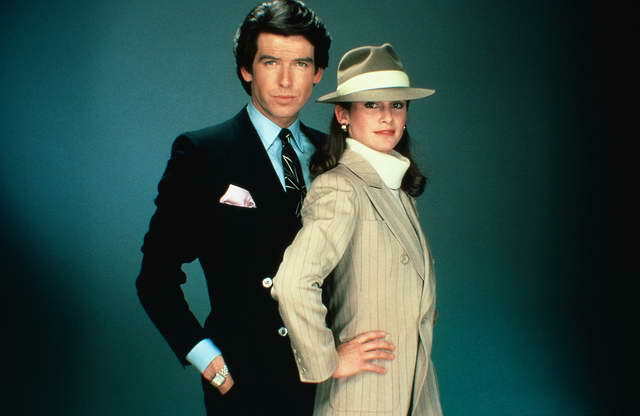 Brosnan, with Stephanie Zimbalist, as Remington Steele. Brosnan has been given the afternoon off. He’s spending it in some style, sipping from a tube of lager as he relaxes on the terrace of the 18th Century mansion in which he and his family are staying. ‘We’ve rented so many houses this year that I’ve lost track of where I am and who I am, quite frankly.’ With Remington Steele no longer a fixture in the TV schedules, the public might also have lost track of who he is. But, as he says, ‘it’s been a busy year’. There will be plenty more chances for autograph hunters to get Pierce Brosnan’s name wrong. We are surrounded by a sample of your actual rolling emerald landscape through which the insistent baa-baaing of sheep is being wafted earwards by a fresh monoxide-free breeze. Brosnan’s three year old son, Sean, is inside watching Superted on TV. His wife Cassie and their two elder children are also close at hand, as is a floppy Retriever called something unpronounceably Gaelic. It’s all very Country Life, but Brosnan looks as though he could be equally at ease in the back room of a pub. ‘This is like an old pair of gloves, really,’ he says. 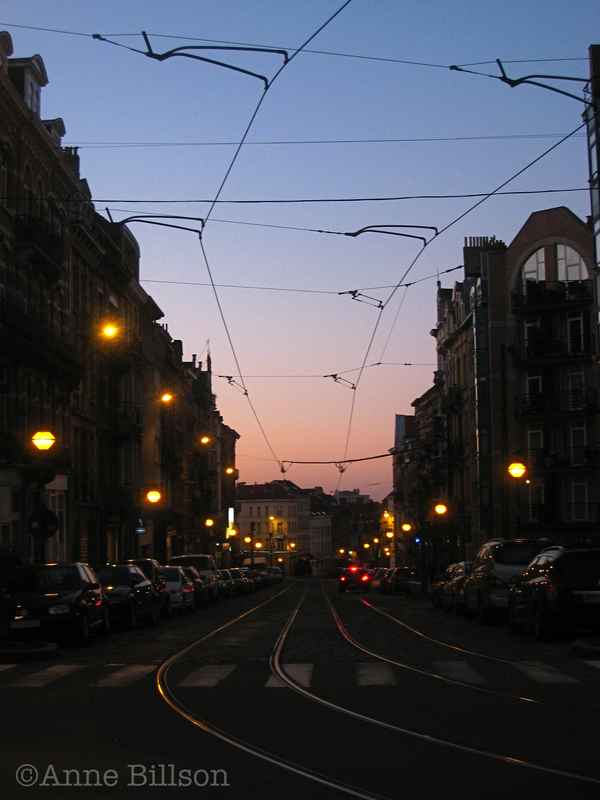 ‘Coming back here is like an old pair of shoes. I feel very relaxed, at one with the land.’ You can tell he’s been living in California. 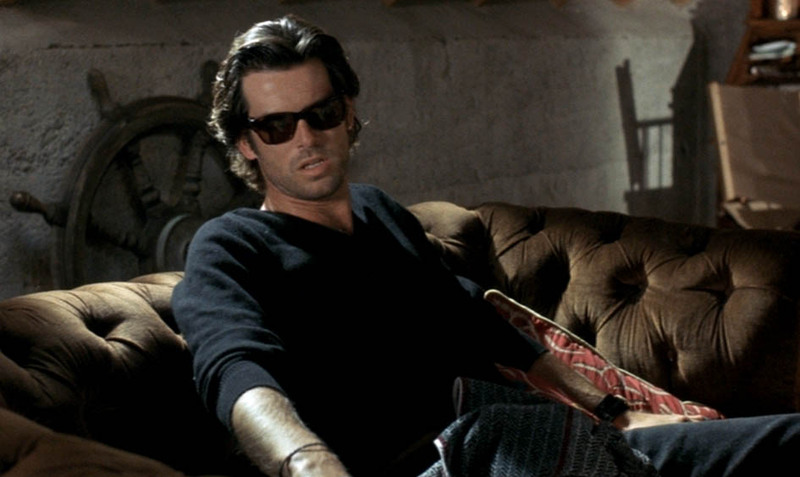 In photographs, Brosnan looks almost impossibly handsome, like Barbie’s boyfriend Ken, only better looking. In real life, with a touch of designer stubble cultivated for his role in Taffin, and with his endearing charm, beguiling brogue et cetera, he is a walking, talking advertisement for Irish manhood. The jacket is Valentino and the socks are Calvin Klein; they are teamed with jeans (of which the label is not visible). His shoes… Well, he says, the left one belongs to him and the right one belongs to Michael Collins. 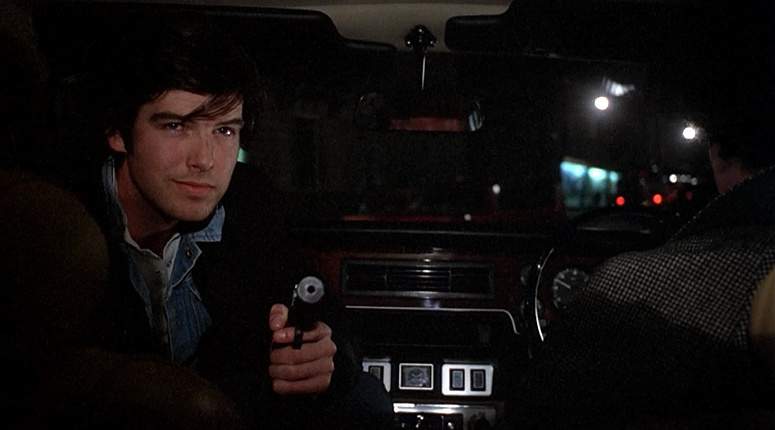 Before young Brosnan went bovverish, he’d been brought up by various relatives in County Meath. His parents parted company soon after 1953, when Pierce was born, and his mother went to London, where she struggled to set up a new life for herself as a nurse before sending for her son to join her there in 1964. 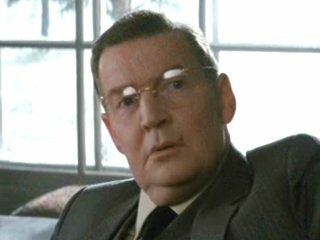 It would be thirty years before Pierce saw his father again; the reunion, which took place in a Dublin hotel, was not a success. Pierce had wanted it to be a private affair, but some of his relatives sold their snaps of the occasion to the press, and the event received wide exposure in the tabloids. After two O-levels (in English and Art) and a short stint as a commercial artist, Brosnan studied drama before paying his theatrical dues in various rep productions up and down the country. Those dark good looks were doing the trick even then, because he was singled out for leading roles by Tennessee Williams [to play the role of McCabe in the 1977 British premiere of The Red Devil Battery Sign at the Roundhouse in London] and Franco Zeffirelli [in his 1977 production of Eduardo De Filippo’s Filumena at the Lyric Theatre in London]. What happened was the TV show Remington Steele (1982-1987), which catapulted him to celebrity status in America, complete with devoted fan club whose newsletter, The PB Chronicles, filed such fascinating information as the fact that PB’s favourite food is cornflakes, and that Judy from Wyoming has seen one particular episode of Remington Steele no less than seventeen times. And as soon as Taffin wraps, he’ll be making a Diet Coke commercial. ‘They were going to film it in British Columbia. Then they were going to film it in Ireland, then Los Angeles, then New York…’ And where did they end up? ‘Now it’s going to be filmed in Peterborough.’ Peterborough, it seems, is the only place with a train that fits Diet Coke’s requirements. Taffin, according to the advance blurb, is ‘a very original action thriller which sees the return of the romantic, if somewhat reluctant, hero.’ It is not stated as to where the hero is returning from, but Taffin is a debt collector who finds himself pitted against unscrupulous businessmen who are planning to construct a chemical plant on the outskirts of his hometown. Doody and Brosnan in Taffin. I have already met McAnally, who has been holding forth in the dining trailer on his theories of heredity: actors breeding actors, athletes springing ready-made from the womb with appropriately athletic physiques, and new generations of Irish dancers being born with naturally thick ankles. McAnally pounces on me as the perfect patsy for a demonstration of English ignorance about all things Irish. ‘Nothing personal,’ he says, going on to ask me the population of Ireland, the name of the third biggest city, the names of the opposition parties, of the Prime Minister, and of the seat of government. I score nul points on all counts. In fact, he gives me a sticky time of it until I cunningly introduce the topic of QPR, which I have read is his favourite football team, and mention of their current league table-topping position gets him beaming benignly. But his lecturing on Irishness has been so authoritative that I conclude he should be the one to know, if anyone does, whether Pierce Brosnan’s Los Angeles lifestyle has turned him into an honorary Angeleno, touching down on Irish soil in the manner of a root-seeking Reagan. Being a man of impeccable taste, however, he has yet to wholeheartedly embrace American beer. ‘I like Moosehead and Corona. Budweiser is like yeeaagghh, it’s like water. But I love beer and I’ve put on pounds since I’ve been over here. 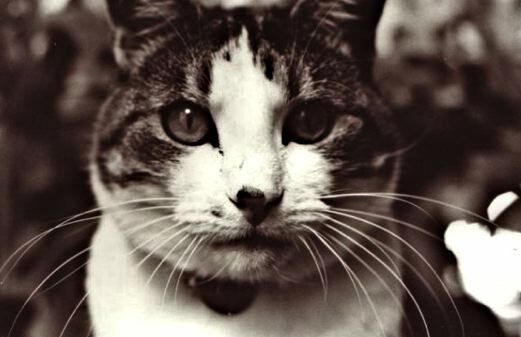 I think I’ll have to check the old weight out shortly.’ (Now weighing in at a respectable eleven and a half stone, he has been known to hit the scales at fourteen and a half.) Unlike many other residents of Los Angeles, he has yet to deprive himself of alcohol and caffeine, but he has, he assures me, stopped smoking. Ten minutes later, halfway through the photo session, I notice he is clutching a lit cigarette.